Cámara Leret studied Fine Arts at Complutense University of Madrid, before obtaining an MA in Conceptual Design in Context from Design Academy Eindhoven. In subsequent research on their Creative Industry Scientific Programme she focused on the role of design fictions in clinical settings. Thompson also studied at Design Academy Eindhoven and is currently collaborating with Arne Hendriks (The Incredible Shrinking Man) on the creation of the worlds first community built floating island of fat - The FATBERG. Thought Collider are now in residence at Somerset House Studios, London. With the support of NHS Lothian's Art & Therapeutic Design programme Cámara Leret is the current Design Fellow at the Department of Clinical Neuroscience in Edinburgh. 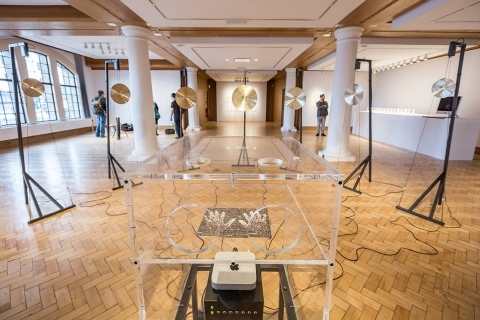 The Alt-w LAB at the City Art Centre is home to our joint research partnership with the University of Edinburgh.